And that is a hard question to answer simply, because it totally depends on your biz, your products, your target audience, your niche, your time & money budget, as well as your own strengths and interests. But there is one thing that we all have, no matter what type of business we run. Customers. Clients. Fans. Supporters. You know, real people who already like what we do! Often times we get so busy looking outwards to find new ideas for promoting our biz, or hopping on whatever platform or strategy that is being touted as the next best thing in small business marketing, that we forget about what is right in front of us. Showing your customers a little love is a great marketing strategy, and it is well worth your time to come up with a concrete plan to ensure that ‘customer love’ doesn’t fall through the cracks when you get busy or when the next shiny bright idea comes along. It costs less/requires less time and energy to maintain existing customers than it is to go find new ones. It is much easier to sell something to someone who already wants it, so focusing on people who already love what you do can make marketing and selling feel a lot easier! People buy from people they know and like, so building a relationship with your customers will pave the way for future sales & referrals. People love getting something extra or unexpected, so going above and beyond with your product & service will make a bigger impression than many other marketing efforts ever will. People love to tell stories/brag about something great that has happened which is another reason to go above and beyond with your customer service and foster word of mouth. Referrals and word of mouth marketing can send you a constant stream of new “right” customers with little added cost or effort on your part. People love to be thanked and to feel appreciated, so when you do get a referral or a testimonial be sure to thank the referrer (and maybe give them some token of thanks as well) and you will foster a long term relationship that will lead to more referrals! Testimonials act as social proof to others who come along; they build trust, reduce fears, and when everyone else seems to be raving about what you do others will jump on board to find out what the fuss is about! Following up with customers after they have made the purchase shows that you care about them and their needs (not just making the sale, but making sure your customers are happy) and will help you stay on the radar of that customer for future purchases. People who already love what you do are very effective at building buzz for any new things that you launch because they genuinely want you to be successful. Your loyal customers and fans are a great source of information; they can help make your current offerings even better, help you test new ideas for products & services, and give you feedback to grow your biz. Focusing on your core group of loyal customers can offer a lot of information and insight about who exactly your ‘right people’ are: their problems/fears/concerns, how you best help them, where you can find more like them, and what you need to say to them when you do. Dealing with people who love what you do is way more fun and rewarding than pounding the pavement and hocking your wares. Building a long term relationship with your customers feels really good, and will keep the joy in your business. None of this is really new. We all know that customer service is a key way that we can stand out and make an impression with our small businesses (and sometimes it is the only way we really stand out.) 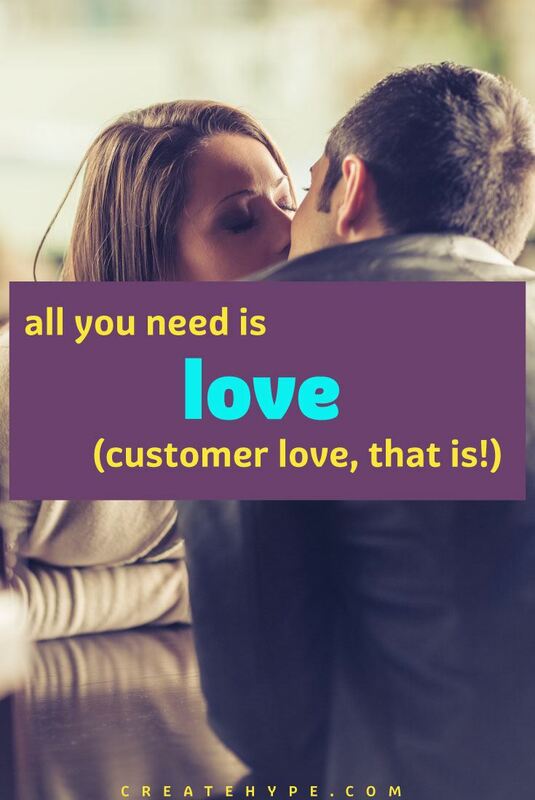 And you might already do these instinctively, but creating an actual ‘customer love strategy’ and including it in your business plans will ensure that it never falls by the wayside, and that you never miss out on an opportunity to build a stronger relationship with a customer that already likes you! By taking some time to build customer love right into your marketing strategy you will ensure that you always have a steady stream of your ‘right’ customers coming your way. Doesn’t that sound awesome? Great ideas in there! Thank you! So true…. thank you for the great article!